is honored on Panel 6E, Line 113 of the Vietnam Veterans Memorial. Burt was my buddy at West Point. I am a military “brat” with family roots in El Paso, TX. We played football together, were on the track team together, and were often on jaunts in the VW I had hidden in Highland Falls, just outside of the WP gates. Burt was a Super friend and classmates and helped me survive WP. 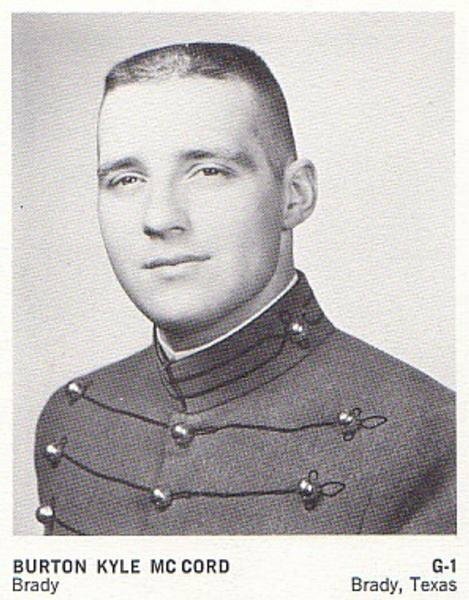 The “Friends of Rocky Versace” remember one of Rocky’s brother alumni from the U.S. Military Academy at West Point - a fellow Armor officer and Airborne-Ranger - CPT Burton Kyle McCord, on what would’ve been his 77th birthday – 28 June 2018. I thought about Burton first thing this morning--and I could hardly believe that if he were alive today, he would be celebrating his 76th birthday. I will always remember him in the way he is pictured here: strong, handsome, courageous. The best big brother a girl could have. No one was ever loved more. The “Friends of Rocky Versace” remember one of Rocky’s fellow alumni from the U.S. Military Academy at West Point, CPT Burton Kyle McCord, on what would’ve been his 76th birthday – 28 June 2017. On behalf of George Washington University and the Men's Basketball Team, we want to thank you for your service to our beloved country. We are forever indebted to you and the tens of thousands on the Wall. You gave the greatest sacrifice for our country, and because of that, we are able to pursue our dreams. Thank you.